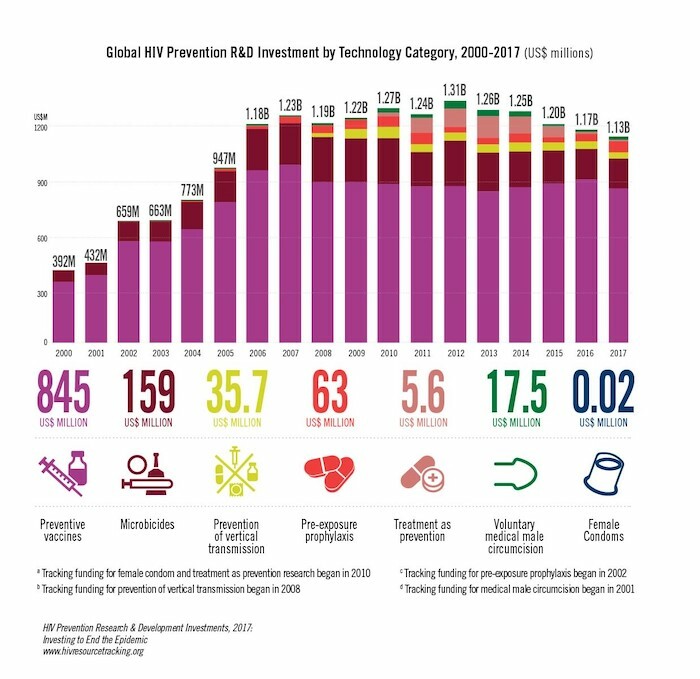 In a financial climate with increasingly limited resources, tracking investment in HIV R&D provides the field with vital information to chart the course forward. Monitoring funding trends allows identification of promising areas where investment is needed, prioritization of research, analysis of the effects public policies have on funding trends and fact-based advocacy to support future investment in research. As later-stage and follow-on trials move forward, understanding and evaluating research in the context of public, private and philanthropic funding is increasingly important to ensure continued movement down the path towards ending AIDS. For more than a decade, AVAC has been a part of a variety of resource tracking efforts—tracking funding for HIV across the research agenda. Since 2004, the Resource Tracking for HIV Prevention Research and Development Working Group (formerly the HIV Vaccines and Microbicides Resource Tracking Working Group) has collected information annually on the amount invested in research and development for HIV prevention options, including vaccines, microbicides, pre-exposure prophylaxis (PrEP), treatment as prevention, male circumcision, female condoms, HSV-2 prevention and vertical transmission prevention, and also cure and therapeutic vaccine research. In 2017 reported funding for HIV prevention R&D declined by 3.5 percent or US$40 million from the previous year, falling to US$1.13 billion. In addition to being the fifth consecutive year of declining funding, this marks the lowest annual investment since 2005. The US public sector contributed three fourths of overall funding at US$830 million, while the Bill and Melinda Gates Foundation (BMGF) made up 91 percent of all philanthropic investment (US$150.2 million out of US$164 million). Together, the US public sector and BMGF constituted 87 percent of total funding in 2017. Funding for PrEP and medical male circumcision (VMMC) increased by 56 percent and 67 percent, while investment towards AIDS vaccines, microbicides, prevention of vertical transmission (PMTCT), treatment as prevention (TasP) and female condoms declined by 5.6 percent, 4.8 percent, 12.8 percent, 45 percent and 99 percent, respectively. US public sector investment decreased by 5.8 percent in 2017, from US$881 million to US$830 million—a decrease linked to the 6.5 percent or US$49 million decline in US National Institutes of Health (NIH) funding. In 2014, the HIV Vaccines and Microbicides Resource Tracking Working Group and AVAC began a collaboration with the International AIDS Society’s (IAS) Towards an HIV Cure initiative. AVAC, Treatment Action Group (TAG) and the IAS brought together a group to review and allocate grants towards HIV cure research and analyze data on global funding. 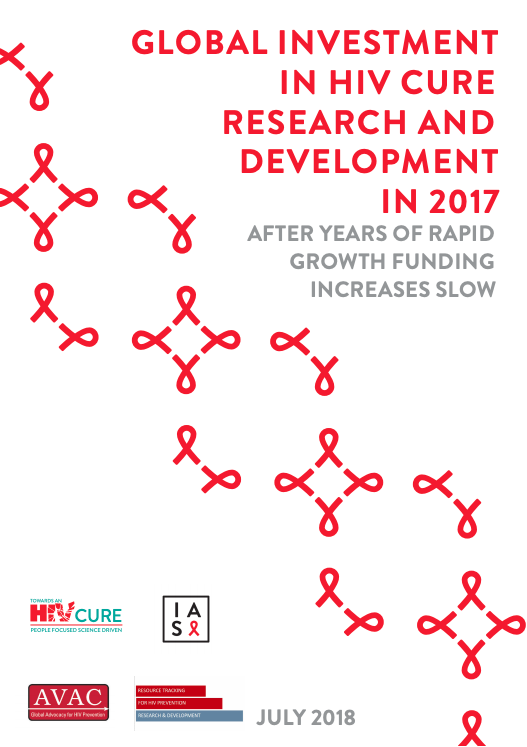 The working group released a report in July 2017, Global Investment in HIV Cure Research and Development in 2016: Funding for cure remains a priority. Since 2009, AVAC has collaborated with the Treatment Action Group (TAG) and UNAIDS to collect and analyze global funding towards HIV treatment as part of the HIV Treatment Research and Development Resource Tracking Project initiative. An Exploratory Analysis of HIV Treatment Research and Development Investments in 2009, was released at the 6th International AIDS Conference on HIV pathogenesis, treatment and prevention in Rome, Italy. 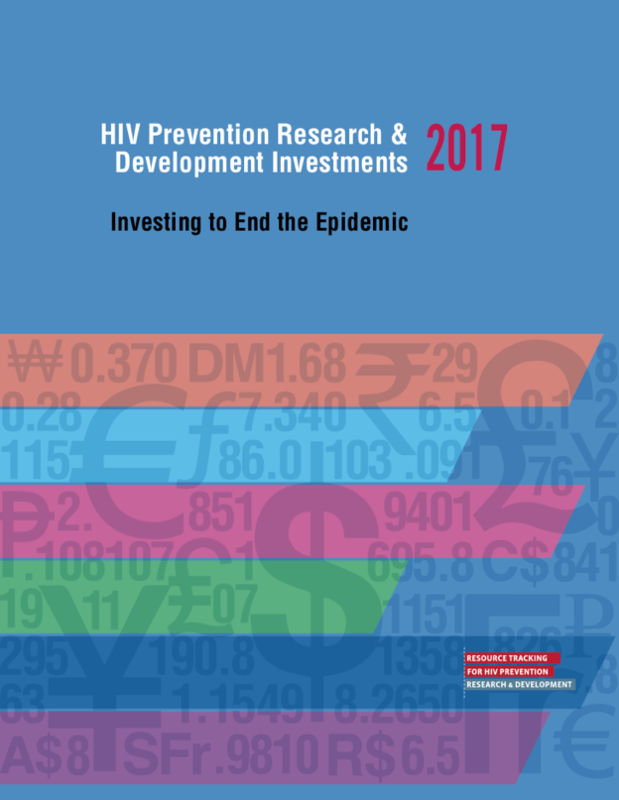 In March 2013, the most recent report Funding Scientific Innovation: Global Investments in HIV Treatment Research and Development in 2010 and 2011 was released. AVAC also worked with UNAIDS in preparing a report on investment in treatment as prevention for HIV and TB entitled Antiretroviral Treatment for Prevention of HIV and Tuberculosis: 2013 update on current and planned research efforts, which was updated in April 2014. In July 2016 at the International AIDS Conference in Durban, South Africa AVAC collaborated with Funder’s Concerned About AIDS (FCAA) to bring together a group of organizations and individuals who undertake and specialize in resource tracking for funding of HIV and related health priorities. The group was an effort to better collaborate in the area of resource tracking, to share methodological knowledge and to bring together sources of resource tracking information for the field. The culmination was a session at AIDS 2016 titled, Using Funding Data to Advocate for Global and Domestic Resources in the Critical Push towards the End of AIDS, featuring resource tracking efforts from the Centre for Economic Governance and AIDS in Africa (CEGAA), the Global Forum on MSM and HIV (MSMGF), Treatment Action Group (TAG), Funders Concerned About AIDS (FCAA) and the Resource Tracking for HIV Prevention research and Development working group. This session was a follow-up to the initial resource tracking collaboration that took place at AIDS 2012 in Washington, DC entitled, Know Your Resources: How to use funding data to strengthen your messages in the critical push for investing in the end of AIDS. For the full picture on investment trends, download the full report. All the graphics from the report are available here.